Tanaka Sake Brewery Kikkogura The stone buildings that were built for the Tanaka Sake Brewery Kikkogura in 1905 have been designated as historic buildings by the city of Otaru. Enjoy free samples of Shiboritate Nama Genshu (fresh Japanese Sake) and 10 other kinds of sake made right on the premises. 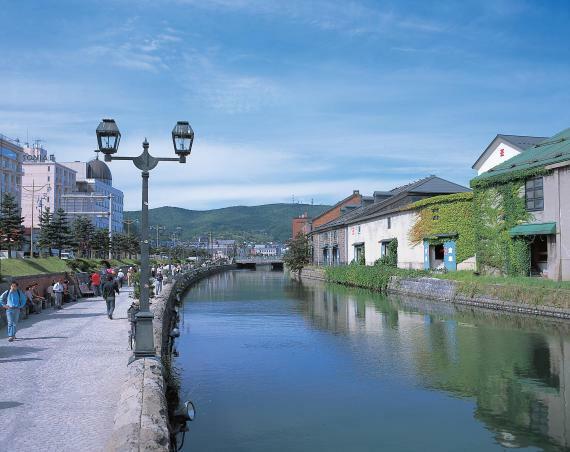 Otaru Canal Otaru Canal was built in the 1920s as a channel connecting warehouses and the Port of Otaru, which thrived as the gateway to Hokkaido during the period of land reclamation. Stone-built warehouses and gas lamps stand along the 1140-meter-long canal, recalling the area’s heyday. Sakaimachi Street Sakaimachi Street is for shopping! You can enjoy the biggest Musical box museum in Japan, Kitaichi glass where you can purchase a variety of beautiful glass and even you can have tea time with famous Otaru sweets like LeTAO, Rokkatei, and Kitakarou! You might see the colorful ice cream which you never ever seen before! Otaru Triangle (Sankaku) Market "Sankaku", it’s mean the triangle. The origin of the name is that the land and the roof is in the form of a triangle. Just 1 min from the JR Otaru station, then you can enjoy very fresh seafood like the salmon, salmon roe and sea urchin. Please enjoy your lunch here with delicious Hokkaido local food! ＊Optional for with Chartered Vehicle The Old Aoyama Villa (Kihinkan) The villa is a symbol of herring fishing history in Otaru which took 6 years to be completed. The traditional alcoves and the gorgeously sculptured fanlights are built in rosewood (Shitan) or Japanese cedar and or so. The paintings and calligraphy on the sliding doors in various rooms are genuine treasures. They were created by Gyokudo Kawai, a great master of Japanese painting working with his disciples. This is a private tour without other people. Our friendly guides are friendly and accommodating. You can walk on your pace without rush. Thank you for your comment, however, this space is for the Customer Reviews after joining the activity. Please kindly fill in the inquiry mail form below. Professional guides are highly proficient in English and have a deep knowledge of Japan’s history and culture and the local areas we are visiting. They are full of warmth and humor and pay careful attention to the needs and preferences of our guests. They are constantly seeking ways to upgrade their skills and experience in order to become the best tour guides. Cubs guides are licensed local guides with fewer work experiences than professional guides. Despite their relatively limited skills and experience, they are attentive and enthusiastic and will offer you appropriate support on your way to explore Sapporo and other cities. We have no doubt you will enjoy travelling with them.